Coming to Campbelltown on August 5: The David Griggs acrylic on canvas work, Zoloft Nation. Between Nature and Sin, the first major survey of David Griggs, an Australian born, Philippines based artist, will go on exhibition at Campbelltown Arts Centre next month. Curated by Megan Monte and presented by Museums & Galleries NSW, the exhibition will bring together portraiture, photography and film developed in Manila, Griggs’ adopted home over the past 12 years. Drawing on political imagery, underground media, local histories and subcultures, Griggs’ work features brazen use of colour and haunting stories of love, loss and death. 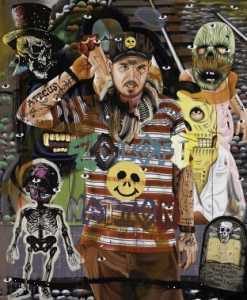 Griggs, Archibald Prize finalist in 2007, 2009, 2013, 2014 and 2016, explores the darker undercurrents of human existence and the entrenched social issues of the city, and the community of Manila. The exhibition will also see the premiere of Griggs’ major feature length film Cowboy Country, one of his most ambitious projects to date which further exposes the profound personal impact of Manila’s culture and people on his practice and way of life. The film was a collaboration with Filipino film royalty, including Soliman Cruz, the late Dante Perez, and Melanie Tejano. “David Griggs landed in Manila 12 years ago after receiving an Asia Link residency and decided to make it his home,’’ explains Michael Dagostino, the director of Campbelltown Arts Centre. “He immersed himself in the vibrant street and underground culture, gaining an intimate knowledge of the city’s social hierarchies and cultural fabric. In addition to cowboy country, other exhibition highlights include Griggs’ project New York London Paris Rome Manila City Jail (2009), which was produced collaboratively with inmates of the Manila City Jail. 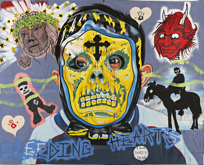 Also, Zombie Kiss and Frat of the obese, which combine borrowed motifs, symbols of popular culture and street stories stolen from the Manila underground scene to articulate the unjust political and social structures of the Philippines, through the eyes of the artist. After showing at Campbelltown Arts Centre (August 5- October 15), Between Nature and Sin will tour to nine galleries across Australia.